Here is a comforting story for us who have been bogged down by uninspiring sporting performances. 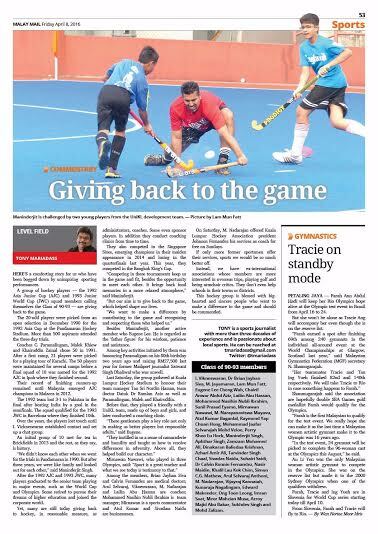 A group of hockey – the 1992 Asia Junior Cup (AJC) and 1993 Junior World Cup (JWC) squad members calling themselves the Class of 90-93 - are giving back to the game. The 20-odd players were picked in an open selection in December 1990 for the 1992 Asia Cup that was held at the Pandamaran Hockey Stadium. More than 500 aspirants attended the trials over three days. Coaches C. Paramalingam, Malek Khiew and Khairuddin Zainal chose 50 and in 1991, after a first camp for the 50, 21 players were selected for a playing tour of Karachi. The 50 players were maintained for several camps before the final squad of 18 was named for the Asian Junior Cup (AJC) in Kuala Lumpur 1992. Their record of emerging second in the AJC remained intact for 20 years before the Malaysian Juniors emerged champions of the tournament in Malacca in 2012. They lost to Pakistan in the finals (3-1) after having defeated India by a solitary goal in the semi-finals. The squad thus qualified for the 1993 JWC in Barcelona in which they finished 10th. Several of these players were overaged for the JWC, so another selection was held from which six players from the local league made the team. Over the years, however, these players lost touch with each other until I. Vickneswaran managed to contact them and set up a chat group. An initial group of ten met for tea in Brickfields in 2013 and the rest, as they say, is history. “We didn't know each other when we went for the open trials in Pandamaran in 1990. But after three years of being together, we spent the best years of our lives as a family who looked out for each other. The comradeship was second to none,” said Maninderjit Singh. After the 1992 AJC and 1993 JWC, many of the players graduated to the senior team and played in major events, such as the World Cup and Olympics. Some retired to pursue higher education and join the corporate world. Yet, many of them are still contributing to Malaysian hockey, as administrators, coaches and sponsor players, and now as a team, they conduct coaching clinics from time to time. year, they also competed in the Bangkok King’s Cup. “Competing in these tournaments helps keep us in the game and fit, besides giving us the opportunity to meet again in a competition environment. It brings back old memories, only this time around, it is in a more relaxed atmosphere,” said Maninderjit. “But our main aim is to give back to the game, which helped shape our lives. Besides Maninderjit, another member who is actively involved in keeping the group together is Eugene Lee. He is regarded as the ‘father figure’ of the group for his nuggets of wisdom, patience and assistance. Among the activities initiated by the Class of 90-93 was honouring their coach Paramaligam on his 80th birthday two years ago and raising RM27,500 for the ailing former sports journalist Satwant Singh Dhaliwal last year and conducting a coaching clinic. Last Saturday, the group gathered at the Kuala Lumpur Hockey Stadium to honour their team manager Tan Sri Nordin Hassan, team doctor Datuk Dr Ramlan Aziz and coaches Paramalingam, Malek and Khairuddin. Before that, the group played a friendly match with the UniKL development team, comprising both boys and girls, and conducting a coaching clinic after that. Said Lee, “These gentlemen played a key role not only in making us better players but also in moulding us into responsible adults. We owe them for what we are today. They instilled in us a sense of camaraderie and humility and taught us how to resolve differences in adversity. Above all, they built our character." “Sport is a great teacher and what we see today is testimony to that,” said Mirnawan Nawawi, a member of the Class of 90-93 who went on to play in three Olympics. Indeed, the squad has made it in life too. Brian Jayhan Siva and Calvin Fernandez are doctors; Arul Selvaraj, Vikneswaran, M. Nadarajah and Lailin Abu Hassan are coaches; Mohammed Nasihin Nubli Ibrahim is a team manager; Mirnawan is a sports commentator; and Atul Kumar and Sivadass Naidu are businessman, to name but a few. On Saturday, goalkeeper coach Nadarajah offered Kuala Lumpur Hockey Association president Johnson Fernandez his services as coach for young goalkeepers every Sunday for free. If only more former sportsmen came forward with their services, sports in this country would be so much richer. Instead, we have ex-international associations whose members are more interested in overseas trips, playing golf and being critical but will not lift a finger to help, especially the schools in their towns or districts. What the Class of 90-93 are doing should be emulated by former sportsmen and women of the various sports. Indeed, this hockey group is blessed with big-hearted and sincere people who want to make a difference to the game however they can, and they should be commended. I. Vikneswaran, Dr Brian Jayhan Siva, M. Jayamaran, Lam Mun Fatt,Eugene Lee Cheng Wah, Chairil Anwar Abdul Aziz, Lailin Abu Hassan,Mohammed Nasihin Nubli Ibrahim, Sunil Prasad Eyamo, Mirnawan Nawawi, M. Narayanaviswa Mayavu, Atul Kumar Baganlal, Raymond Yap Chuan Hong, Mohammad Jaafar Selvarajah Mohd Veloo, Perry Khoo Eu Hock, Maninderjit Singh, Aphthar Singh, Zamzam Mohamed Ali,Dinakaran Baliedaa Krishnan, Azhari Amir Ali, Tarvinder Singh Chaal,Sivadas Naidu, Suhairi Saidi, Dr Calvin Ronnie Fernandez, Nasir Maidin,Khalil Lau Kok Chim, Simon C G Mathew, Arul Selvaraj Anthoni,M.Nadarajan, Vijayraj Kannaiah, Kunaraja Nagalingam, Edward Makender, Ong Toon Leong, Imran Saat, Meor Mahzian Musa, Azroy Majid Abu Bakar, Sukhdev Singh and Mohd Zalizan.